I love instagram, I never get bored of it. Every day is a different photo, a different project or gig, new inspiration from others. It has allowed me to create a business around everything that I love and given me some amazing opportunities. I feel really lucky to have found my little corner of the internet. I can be creative, which I love, I can work from home, I can share my passion. I can be myself (which truly varies from day to day) and it makes me find a little beauty in every day. It's everything I would want in a job. You can read all about how I found my way down this path here. Believe me when I say my life is not perfect. Please know that every photo posted on instagram, by me, or anyone else, is just a small, perfect moment in time, their whole lives are not perfect, I promise. But I love the challenge of creating and styling photos everyday or looking for something beautiful or different to take a photo of. It has really changed the way I see the world. Beyond that, I have met, both in real life and virtually, some really amazing people, many of which I now call my friends. It the perfect place to find like minded creatives in a world where creatives sometimes have a hard time finding their place. I personally find Instagram to be a fascinating platform, I have read countless articles and posts about it and different Instagram tips and strategies you can use. I'm certainly not an expert but I'd like to think I know a thing or two. There are tons of beginner Instagram tips available just about anywhere, so I tried to dig deep and go beyond the basics of just hashtagging. Next to party advice, Instagram is my second most popular inquiry so I finally decided it was high time to blog about it. It's not my usual topic of discussion but here are my top Instagram tips! Also don't be afraid to edit, all bloggers do it. Brightening, adding contrast, and cropping are all little things that can make a big impact. Curating the perfect feed is something that you improve on over time. It takes lots of practice and trial and error to get into the groove. Try to edit all your photos similarly for a cohesive look in your feed. There are so many great, free apps that can help you with this. (Video on how I edit coming soon too). I think it's important to stay on topic for sure, stick to your niche (and if you don't have one, find one), but I also think audiences like to hear about the person behind the photos. You can also do that by using instastories to take your followers behind the scenes. I try to tie my life into my posts a little and post a lifestyle photo once in a while so people learn about me too. They become more involved in your story and become more loyal followers. Just don't go overboard unless you are a lifestyle blogger, of course. I'm actually going off topic by blogging about blogging right now, but I know a lot of my readers will find it interesting as I get a lot of questions about it. But if I were to suddenly start blogging about my cats, I'm not sure my audience would be too interested in that, even if I am. Also, Instagram categorizes you based on the actions you take in the app. If you are following and interacting with people in your niche, Instagram's algorithm will learn that that is what you are into and they will categorize you accordingly. So keep that in mind! Visit your page from someone else's page and click the down arrow to the right of your photo to see who you are grouped with now. If it's not your niche, you might want to work on that. Suggested users is one of the best ways to organically grow your following. I'll be the first to admit videos are scary. But videos in the form of posts, and/or instastories are a growing aspect of social media that shouldn't be ignored. They can't be edited like photos to look picture perfect so they feel more real and they add life to your feed. Don't be afraid to give it a try. It can definitely boost your reach and draw in your audience. Ugh how I hate the word NETWORK. I just picture a bunch of people in pantsuits at a happy hour passing out business cards to everyone that engages them in small talk. Not my idea of a good time. I have since learned that that is not at all what networking has to mean. Networking can be as simple as reaching out a local bloggers and seeing if they want to meet for coffee (or ice cream and yes, it's that simple). I've meet with bloggers with followers of ranging all the way from 2,000 to 200,000 and have learned something new every. single. time. Networking also means interacting with other instagrammers, becoming friends and supporting each other's posts. Always try to comment back and like the photos of the people that like yours. Same with anyone that watches your stories. Try to use their name in your comments to make it feel more personal. I also frequently reach out to other bloggers in my niche to see if they want to collaborate. Some of my favorite ways to collaborate with bloggers similar to me are Follow Fridays via instastories or sharing a link of theirs with a tag to their profile on my stories and they do the same for me in return. I've also styled and/or attended events alongside a couple of other local bloggers and we shout each other out that way also. Use and search hashtags to find others in your niche. I also always recommend geotagging your city and/or nearby cities to connect with locals. If opportunities aren't coming you way, find them! It's called social media for a reason. Engage, engage, engage. It takes a lot of time but is the best way to grow a following. Engaging with new people everyday is the best way (for at least an hour a day if you can), just engaging with the same people all the time, though helpful, won't maximize your growth. 6. Work for that re-gram girl! One of the best ways to gain followers is to get your photo re-grammed. The best way to do this is to tag companies who's products are shown in your photo. Easy enough but there are a few things to keep in mind here, companies don't want to share a photo if it also shows products from a competitor or if their product is the teeny tiny one in the corner of the photo, half cut off. They also won't want to regram a photo of a product that they no longer carry or that is out of season. When I really have a goal of earning a re-gram I do it intentionally. I still only post things that I love (promise!) but if I'm hoping a company will re-gram it, I try to style it in a way that I think they would like that really showcases their product. This doesn't mean you can't include other items in the photo but it should compliment the product and not scream another brand name on it. If you are selling products, reach out to bloggers and ask them to share tagged photos in exchange for free product. Another thing I like to do, is if I am sent a product or have a great idea to shoot a product or place I'm at, even if I don't post it myself, I will send it to the company asking them to simply tag me if they use the photo. A win-win, they get content, you get tagged. Ideally you only want to bother doing this with brands that have big followings of course, to gain maximum exposure. Also, sometimes there are specific hashtags you can use for your niche that can help you get regrammed by feature accounts. Feature accounts are accounts that do not share their own content, they strictly share the content of others with credit given. I keep a list in the notes app on my phone and use them when appropriate in hopes that one of them will see it and regram it. This one is a little more difficult until you gain a bit of a following usually but finding similar accounts in your niche or brands that align with yours and doing a "takeover" where you post photos on their account for a day (usually 3-4 throughout the day) and also letting your followers know you're going to which brings attention to your account and theirs, benefitting both parties. You can also try a "Follow Friday" where 2-4 bloggers agree to promote each other's feed on a specific day (usually Fridays) to gain more followers that way. You can also team up with other bloggers, instagrammers, or companies to do a giveaway where you all pitch in for a prize and people looking to enter, have to like each of your pages in order to qualify. Or ask them to tag friends in the comments for them to enter, exposing your page to more people. At the end of the day, Instagram is a community and the more interacting you do, the more that will also come your way. I hope these Instagram tips help and if you have any other questions or things to add, please mention them in the comments! 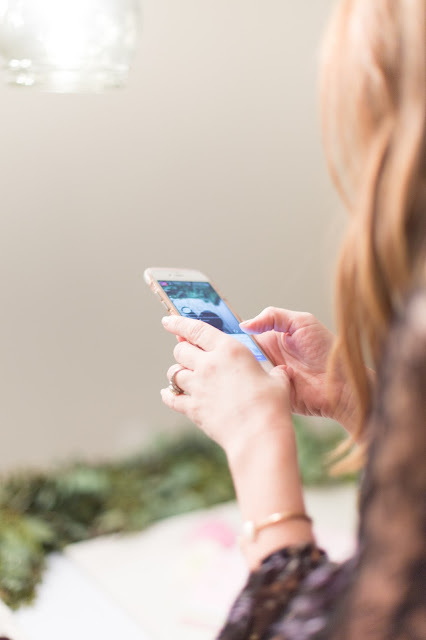 Here's another great post that I stumbled on about gaining more instagram followers written by Jillian of Catch My Party. A few of my parties have been featured on her site and she has some great advice! Love this! Will definitely be using some of these tips to get more following on my Instagram Event Planning page :)!